It's Simple! The More You Buy. The More You Save! The prices below indicate the amount you Save Off Each item price above in Red at the quantity levels indicated. When purchasing the 2 Door Power Lock Kit (Universal), consider the other items listed below. You can add all desired items from below at one time by clicking the Suggested Items Add Page link. 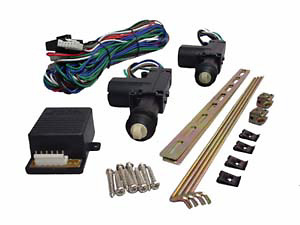 Convert your manual door locks to power with this Universal 2 Door Power Lock Kit. Complete with two door lock actuators and harware.